The Hub Network, a destination for kids and their families, once again dominates Halloween with its annual Haunted Hub programming line-up, a month-long celebration of all things spooky, featuring the premieres of two original Hub Network series; the first-ever, star-studded “Halloween Bash” with a 50-state costume contest that anyone can enter and anyone can win; and Halloween-themed movies and stunts the entire family will enjoy. The spook-tacular schedule includes the premiere of the new animated series, “Sabrina Secrets of a Teenage Witch,” starring Ashley Tisdale, on Saturday, October 12, 12 p.m. ET/9 a.m. PT. Also on Saturday, October 12 at 7 p.m. ET/4 p.m. PT, new episodes of the 2013 Daytime Emmy(R) Award-winning series “R.L. Stine’s The Haunting Hour: The Series” return. 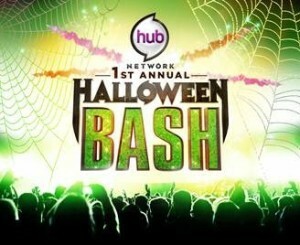 The Haunted Hub celebration also includes the Hub Network’s biggest event ever – the “Hub Network’s First Annual Halloween Bash,” Saturday, October 26, 8-10 p.m. ET/5-7 p.m. PT, featuring the first-ever nationwide Halloween costume competition. That same night, the Hub Network will use this pivotal special to launch its new live-action series, “Spooksville,” at 10 p.m. ET/7 p.m. PT. “Sabrina Secrets of a Teenage Witch” features the iconic teen character re-imagined for a new generation in an all-new animated series starring Ashley Tisdale (“High School Musical”; “Scary Movie 5”). In this half-hour series, Sabrina (Tisdale) is half-witch, half-human, and all super hero as she leads two vastly different lives – one disguised as a normal, klutzy high-school student and the other as the top sorcery student in the magical world. When her two worlds collide, Sabrina is the only one who has the power to battle her foes, while managing to keep her magical identity a secret from humankind. The series is produced by Moonscoop; Archie Comic Publications, Inc.; DSK Group, India; Laughing Lion; and Telegael Teoranta. “Sabrina Secrets of a Teenage Witch” premieres Saturday, October 12, 12 p.m. ET/9 a.m. PT, which is its regularly scheduled time period. “R.L. Stine’s The Haunting Hour: The Series,” which won the 2013 Daytime Emmy(R) Award for “Outstanding Children’s Series,” returns with all-new tales of suspense inspired by R.L. Stine, the master of kids’ spooky storytelling. The half-hour anthology series aimed at kids and teens will premiere with two back-to-back episodes. The first is titled, “Séance,” which brings the chills as three young girls set up what they believe is a fake séance but soon realize what was once an old tale is actually real. Following that is “Detention,” during which an unlikely group of high-school students spend the afternoon together in detention, where strange things and people start appearing out of nowhere causing everyone to freak out. “R.L. Stine’s The Haunting Hour: The Series” is produced by Front Street Pictures in association with The Hatchery, LLC. The series premieres on Saturday, October 12, 7 p.m. ET/4 p.m. PT. New episodes will air weekly on Saturdays at 7:30 p.m. ET/4:30 p.m. PT starting October 19. “Hub Network’s First Annual Halloween Bash” is an all-new two-hour special celebrating the best of Halloween with a nationwide costume competition judged by a panel of celebrity presenters, including Halloween-expert Martha Stewart. The two-hour extravaganza will feature chart-topping musical performances, celebrity presenters and lots of entertaining tricks and treats for kids and their families. The live-to-tape special will take place at Barker Hanger in Santa Monica, Calif. Bob Bain serves as executive producer and Paul Flattery is producer for Bob Bain Productions. It will be broadcast Saturday, October 26, 8 p.m. ET/5 p.m. PT. “Spooksville,” featuring up-and-coming teen stars Keean Johnson (“Billy Elliot” – Broadway) Katie Douglas (“Defiance”) and Nick Purcha (“R.L. Stine’s The Haunting Hour: The Series”), is a new live-action series based on the acclaimed books by author Christopher Pike. “Spooksville” follows Adam (Johnson), the new kid in town who discovers that he holds the key to a battle between good and evil that has been taking place for centuries in a bizarre small town that plays host to a wide array of supernatural and unexplained occurrences. The series is produced by Springville Productions, Front Street Productions and Jane Startz Productions. “Spooksville” premieres in a special time period, immediately following the “Hub Network’s First Annual Halloween Bash,” on Saturday, October 26 at 10 p.m. ET/7 p.m. PT. The series will air weekly on Saturdays at 6:30 p.m. ET/3:30 p.m. PT starting November 2. There will be a special Halloween episode of “Spooksville” on Wednesday, October 30 at 7:30 p.m. ET/4:30 p.m. PT.